Just a heads up - I have some new stamps over at Impression Obsession! 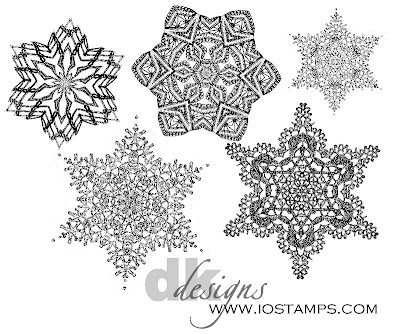 There are some seasonal stamps, like the crochet snowflakes below, collaged fall leaves, and a small collection of Valentine stamps! I'll share a card using those next week for our "Sending Love" challenge. You'll love the variety in this new stamp release - you can see them all in the New Stamps section! Here's a quick card using the snowflakes - I love the detail on these! They were made using illustrations of vintage lace patterns. I embossed 2 of the snowflakes on an assortment of Inchie and Twinchie squares from Inchie Arts - I love embossing on these squares because they do not warp! In general that's the main reason I'm allergic to embossing otherwise...! The embossing created a perfect resist for a watercolor wash, using Shinhan Premium Watercolors. Love the sort of batik look all those pigments created, and with the arrangement of the squares, it reminds me of a fancy quilt. Busy week here as we prepare for an end-of-semester celebration... lots of fun stampy stuff coming up this weekend too... a blog hop with the Shinhan and Marker Pop teams, and a fun Comfy-Cozy Virtual Stamping Night! Gorgeous creation with the beautiful background and I love your snowflakes ! Absolutely, gorgeous with a capital "G"!!! This is one of the prettiest cards I've seen in a long time. Beautiful Dina!! Good luck with the celebration! Beautifully done! I love the detail as well - especially with the beautiful blue/purple background. Gorgeous!! Wow...this is beautiful...love these stamps!! This is such a beautiful card! I love your watercolor wash. And I wish I could afford all of your stamps!! I was just looking at the Inchie Arts blog and commented that they should display this card on there blog as well. I was not sure if you had sent this one to them. It is wonderful. Thanks for sharing.